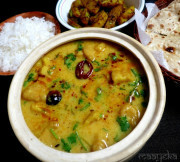 Sindhi Kadhi -is the most popular recipe from Sindhi cuisine. When I came to Dubai then I learned this kadhi recipe from my Sindhi neighbour who was a great cook and a beautiful soul. Now this Sindhi kadhi is the most popular kadhi of my family and is cooked on almost each weekend. The recipe and the ingredients are quite easy and simple and you can easily make it in bulk for a party or large gathering. 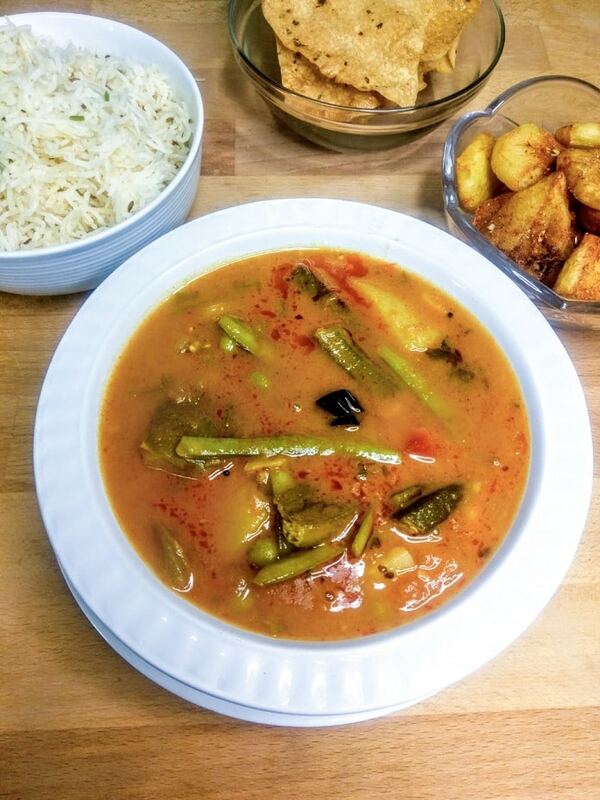 Along with this Sindhi kadhi recipe I learned so many other delicious recipes of Sindhi cuisine from my neighbor and makes them regularly. Sindhi Kadhi- Usually when we make kadhi then we add besan ka pakora,boondi ,vegetable fritters etc. in the kadhi. The gravy/curry of kadhi is also made with besan and the pakora’s are also made with besan/gramflour. The pakora/ fritters are deep fried in oil. So lots of gram flour and the fried fritters makes it delicious but quite heavy on the stomach. This kadhi is made with roasted gramflour/besan and fresh tomato puree. Instead of pakora or boondi lots of vegetables are added in the kadhi which adds nutrition,taste and makes it light to digest. Addition of tomato puree and the vegetables gives a very nice taste to the kadhi. After adding the tempering of cumin,mustard and fenugreek seeds ,besan /gramflour is added in the tempering and roasted on low heat till it turn golden in colour. Then either add tomato puree or plain water ,all the spices and the vegetables and cook till the vegetables become soft. 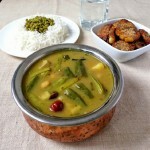 The main vegetables to be added in the kadhi are- potato,okra/bhindi, guvar/ cluster beans/ drumsticks and brinjal. You can also add carrots, lotus stem, cauliflower, green peas, pumpkin/lauki ,beans and tinda in it as per your preference and availability . For sourness and the tangy flavour tamarind pulp is added in the kadhi. Addition of fresh tomato puree is optional you can make it without adding tomato puree,But addition of tomatoes enhance the taste of the kadhi and I always make with tomato puree. 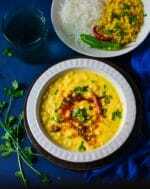 Sindhi kadhi is usually served with jeera rice or steamed rice. Personally I prefer it with jeera rice (without any garam masala). Fried papad, Aloo Tuk- Fried aloo,arbi and brinjals and sweet boondi is served along the Sindhi kadhi. Chop okra and cluster beans in 3 inch long pieces. Chop the potatoes, brinjals and cauliflower in big pieces. Deep fry okra pieces, You can also fry cauliflower and brinjal if you want to. Heat oil in a pan, add fenugreek seeds, cumin, and asafoetida. When the start crackling, add chopped green chillies, whole red chillies and curry leaves. Add gram flour and fry on low flame to a nice golden color, keep stirring. Now add the cluster beans and saute with gram flour for a few seconds. Add a glass of water and stir well. Ensure that no lumps are formed. Add the fried brinjal, cauliflower and tamarind paste and cook on a low flame for 5 minutes. Add the fried okra, chopped green coriander and cook for 5 minutes. 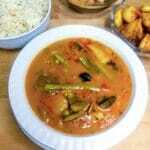 By now, the oil should start coalescing over the stew, which indicates that the Kadhi is cooked, and ready to serve. * You can also fry brinjal and cauliflower before adding in the kadhi . Can add any other vegetables of your choice. You can also make this curry without adding tomato puree . Serving suggestions: Serve tomato kadhi with ,boiled rice,cumin rice and roti. That looks great! Tomato Kadhi is new and need to give this a a try! very yummy looking with loads of veggie..
Wow. Looks perfect & tempting. looks delicious, never tried before.. 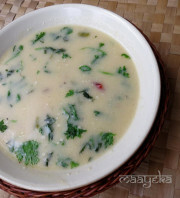 This looks like a very wholesome kadhi..will have to try it soon..